We are looking to encourage more ZL activity on the HF bands. The goal is simple: see how many days you can have four or more QSOs on any of the MF/HF bands, 630m to 6m during 2016. A minimum of 50 days will qualify you for a Bronze Certificate, 100 days Silver, 200 days Gold and 300 days Platinum. This is not a contest so the only requirement for a QSO is to log a call sign and signal report. After that the QSO can be as long or as short as you please. All HF QSOs using any mode count including ZL to ZL QSOs. You can also count all QSOs you make with a branch or club call sign (although you will need to obtain an extract of the log showing the QSOs you make). If the challenge of four QSOs a day is not enough then there is the opportunity to endorse your award by making your QSOs on a single band, or using a single mode, operating QRP, or for working 100 or more DXCC entities. Do you want to explore propagation on a certain band, improve your CW skills, or work as many different entities as you can during the year? This award will (I hope) give you an incentive to do this. In fact you could do a combination of all of them e.g. 17m CW while operating QRP and aiming for 100 countries. Logs will be required to be sent to Mark ZL3AB at the end of the year, preferably in ADIF format, although paper logs will be accepted. You do not need to extract the four QSOs for each day you wish to count from your log and send them to me as one file (although that would be helpful). With the blessing of his family, the award has been named after Lee Jennings ZL2AL SK who was a very active HF operator, friend and mentor to many. He loved to encourage people to get active, set goals and then help them strive to achieve them which is what this award is all about. Meaning of QSO: A completed two way QSO with an amateur station swapping as a minimum Callsigns and a signal report appropriate for the mode used. The QSO can otherwise be as long or as short as you like. This can include QSOs made during contests and nets. Callsign: You may claim QSOs using any callsign you are licenced to use during the marathon period including overseas operations such as being on a DXpedition. You may also include QSOs you make using a branch or contest club callsign. 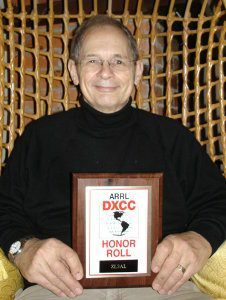 Worked 100 DXCC Entities: The QSOs submitted show contacts with Amateurs in 100 or more DXCC entities. Single Mode: All QSOs submitted must be any one of CW, SSB or a single Digital mode e.g. PSK31. QRP: All QSOs submitted must be 5W or less for CW or Digital, or 10W or less for SSB. Single Band: All QSOs submitted must be on one band. Endorsements are applied for when you submit your log. Judging: Mark’s (ZL3AB) decision is final and no correspondence will be entered into. Your name, address, email address, callsign(s) used, the number of days you claim meet the Object and any endorsement you wish to apply for. A list of your claimed QSOs with the date and time, your callsign (where you submit a log with more than one callsign used) callsign of the station worked, band and signal report. Logs can be in any electronic format and must be submitted by email to mark [at] zl3x.com by 10pm Sunday 3 January 2017 NZDST. ADIF or Cabrillo formats preferred. UTC time/date is preferred however logs may also be submitted using NZDST or NZDT provided this is clearly identified. Paper logs will also be accepted by post to 12 Ruahine Place Christchurch. Due to the tight deadline if you wish to post a paper log after the end of the marathon please contact Mark (ZL3AB) at the email address above or by post prior to the end of the marathon so arrangements for log checking can be put in place. Results: will be published in the February 2017 CQ DX column in Break-In (which is why entries must be in by 3 January).